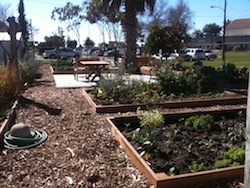 Ocean Friendly Gardens (OFG) Event held Saturday, February 1, 10am-Noon. Patagonia Firehouse. Ventura County Surfrider’s Ocean Friendly Gardens, The Westside Ventura Community Council, Restore Ventura, Friends of the Ventura River, and Patagonia joined forces for the Westside Garden Walk/Lawn Patrol! Keynote speaker Paul Jenkin presented issues and solutions with respect to the Ventura River and Santa Clara watersheds. Following the presentation the assembled group toured the Patagonia grounds and learned about some of the water harvesting solutions Patagonia has implemented. Following this, the group walked up Olive St. and the bike path to see Ocean Friendly Gardens in action in the community. Julian DeAnda at the City of Ventura supplied details of a swale project which will be implemented at Westpark. The group saw a number of examples of positive change. The tour ended at the home of the Gallegos family, where we shared an impromptu salad picked from local gardens. Ocean Friendly Gardens prevent runoff by investing rainwater in “sponge gardens”, and using that water to grow native plants and food. Find out more! Stay tuned for more OFG events in the future!